Interactive Display Creator is an interactive multimedia display software suitable for schools, exhibition halls, banks, hospitals and other public areas. 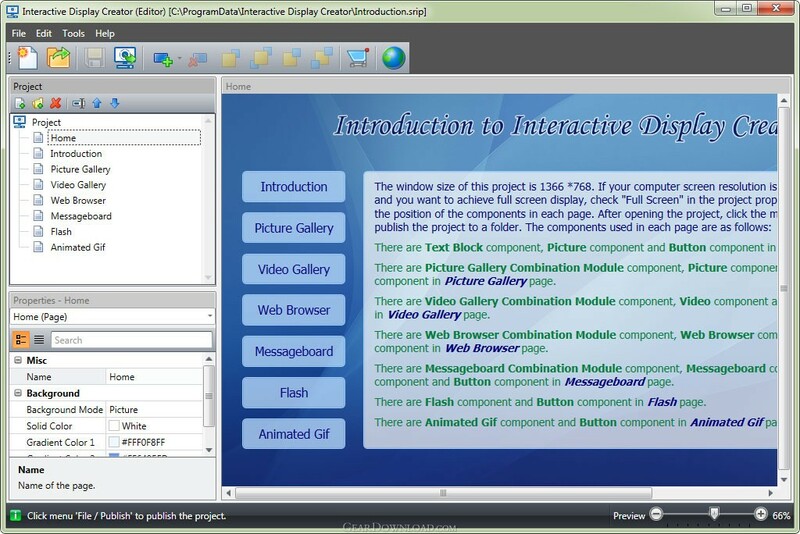 This software can be used to create rich multimedia interactive display system without professional computer knowledge. Picture, video, web browser, rich text, messageboard, Flash, animated gif can be added to the display page. Users can navigate between pages by clicking the button which links to a page. Using the combination module provided by the software, you can quickly set up a page that can browse the picture gallery, browse the video gallery, browse the web pages, or handwrite messages. *Support to add pictures and videos to the display page. *Support to add Flashes and animated gifs to the display page. *Support to add rich text format (.rtf) documents to the display page. *Support to add web browser to the display page. *Support to browse picture gallery. *Support to browse video gallery. *Support to handwrite messages, message pictures can be sent to preset E-mail addresses or uploaded to FTP server. *Support to set the position and size of the display window. *Support to open screen keyboard. *Support to display the published project on other computers. This download (idcTrial.exe) was tested thoroughly and was found 100% clean. Click "Report Spyware" link on the top if you found this software contains any form of malware, including but not limited to: spyware, viruses, trojans and backdoors. InstantInvoice 3 3.4.10 - Invoicing software for the small business. Track customer payments. Fast Setup. Rendez-vous 3.1 - Manages appointments and client information. Shift Scheduler for Excel 1.21 - Excel spreadsheet creates employee schedules, and tracks costs. CyberMatrix In Out Scheduler 3.01 - Group employee attendance management program. Paper Valet 2.1.09 - Easily scan, categorize, store, and retrieve your documents digitally.